Our last meeting for March was a beautiful day out at Percy Spencer, with Brian Fuller’s Punter’s club providing terrific atmosphere throughout the day, cheering on horses in races all around the country. The opener went to Bunbury galloper SCENIC JOURNEY who was able to sit off HAPPY SANDAY and let down impressively over the final 100m. The second of the maiden events again went to a travelling trainer, this time former local boy Darren McAuliffe unveiled impressive three year old ALTANI who will now contest in Saturday’s $100,000 Raconteur Stakes after his 3 ½ length win. Peter Western continued his quality over quantity approach to the Great Southern season. MAGIC OPUS was able to lead all the way under the control of Andrew Castle, recording a 2 length win at a surprising 21-1. The fourth event was another upset, with BLIZZARD EXPRESS narrowly holding off the in-form TRANQUILLA SUNRISE. It usually doesn’t take until Race 5 for Team Wolfe to roll out a winner, but it was CLEO’S AFTERPARTY’s turn in the club colours, managing to out stage stablemate BENTLEY’S BROTHER in the ALBANY AVIATION AIR CHARTERS Handicap. 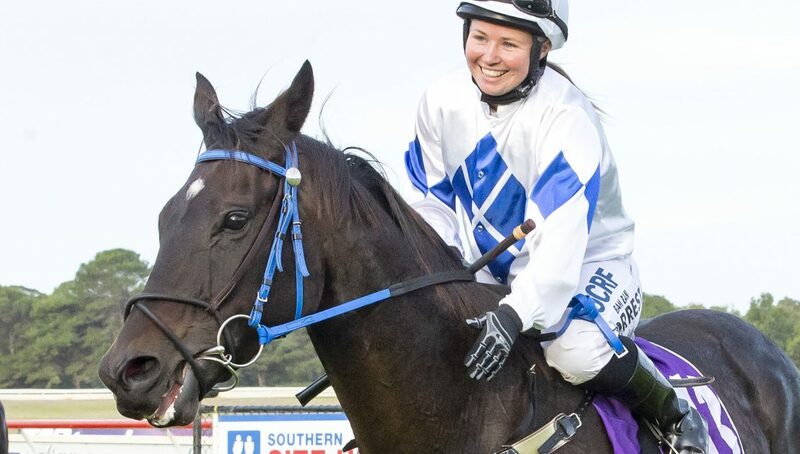 True to form, Roy Rogers Racing immediately responded in their neck and neck race for the trainer’s premiership with SJ-Wolfe Racing, when NOTTA MOCHA displayed an impressive turn of foot in the concluding stages of the ALBANY STOCK FEEDS Handicap. A spanner was thrown into the works at the gates before the final event of the day, with hot pot favourite THREE SECRETS scratched on vets advice, the result saw the markets impacted heavily and perhaps the map for the race too, with LITTLE PUNGA torpedoing plenty out of the quaddie and holding off the rest of the field at 51-1. As the longest priced winner of the day, trainer Mark Westthorp receives a Hygain voucher for his troubles. After the running of the Mt Barker Cup meeting as well, Daniel Staeck retains a healthy lead at the top of the Jockey Premiership with 19.5 wins for the season, with Jason Whiting now sitting on second with 11 wins. Steve Wolfe and Roy Rogers’ head to head battle in the trainer’s premiership went another two rounds with both trainers trading blows. Gauged taking out the Mt Barker Cup on Saturday see’s Wolfe move to 2.5 wins clear at 25 and 22.5. Paul Hunter and Jonathon Jachmann hold equal third with 5 wins each. In the Ryde Building Co Apprentice Leader Board, local Shelby Colgate holds a 6 win to 2 lead over Jade McNaught. Roy Rogers retains top spot on the Hygain strike rate award leader board, however his percentage has dropped slightly and after Magic Opus starts on Friday, Peter Western will be sent straight to the top of the standings after meeting the 15 start criteria. Mark Westthorp’s win with Little Punga has also seen him jump to outright second, pushing Steve Wolfe to third. Stephen Sheehy holds fourth, whilst Jonathon Jachmann’s win at Mt Barker sees him push Dixie Solly out of fifth place.